Really awesome stuff! 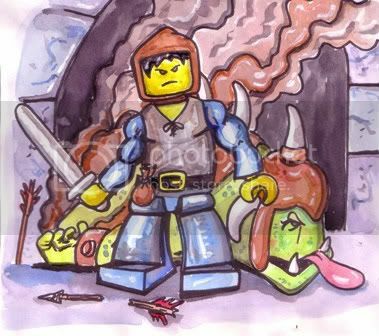 It's always great to see minifig art from you, I'm a huge fan of your work. The posing is all exceptional. 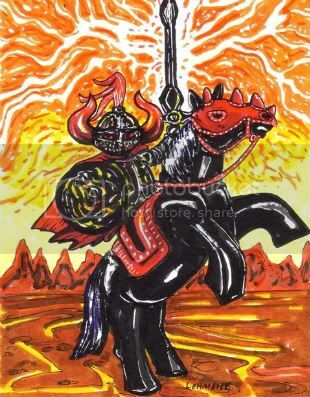 I particularly like the horse's helm and all of the great detail around the sword. Very nice! That is awesome! You've really got a talent. That simply blows me away! You're really talented and creative (I have the artistic creativity of a snail). I especially enjoy the sheild and how the horse still looks LEGO-ish. How long did it take for you to do this? Thats a very great drawing! Thank you for the kind words. The posts inspire me to keep making more Lego art. Zepplin- This one took about an hour. 10 minutes to sketch, check proportions. 15 minutes to ink the lines and then 35-40 minutes to render. Wow! I really love "The Price of Gold" - The shadowy figure in the background is an awesome touch. Gotta' be one of my absolute favorite drawings from you thus far.
" 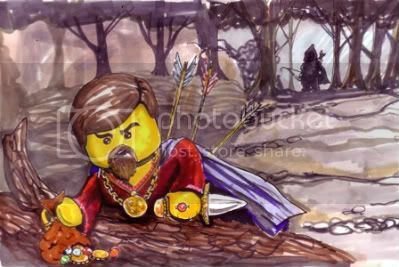 I should of just dropped the gold and I may have outrun Robin Hood "
Thor wrote: " I should of just dropped the gold and I may have outrun Robin Hood "
Love the new pic of Victor! "They don't have a cave troll anymore..."
Wow, that's really good! My favorite one is the first! Amazing job! I can't wait to see if you do more in the future!